The Battery, San Francisco’s new members-only club, has quickly become a trendy home-away-from-home for many of Silicon Valley’s tech moguls — the kind of place where you might see a founder closing a deal with a venture capitalist over a bone-marrow appetizer. It was started last year by Michael and Xochi Birch, a dot-com couple who sold their company to AOL for $850 million and then set about making an exclusive, Soho House–esque retreat for their fellow well-heeled San Franciscans. The private club, which is open to non-techies as well, features a restaurant, gym, twenty-person hot tub, koi pond, wine cellar, and taxidermied animals on the walls. 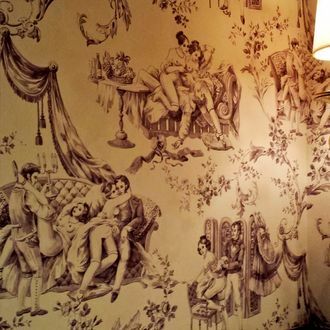 As at Soho House, taking photos inside the Battery is strictly prohibited in order to preserve members’ privacy. 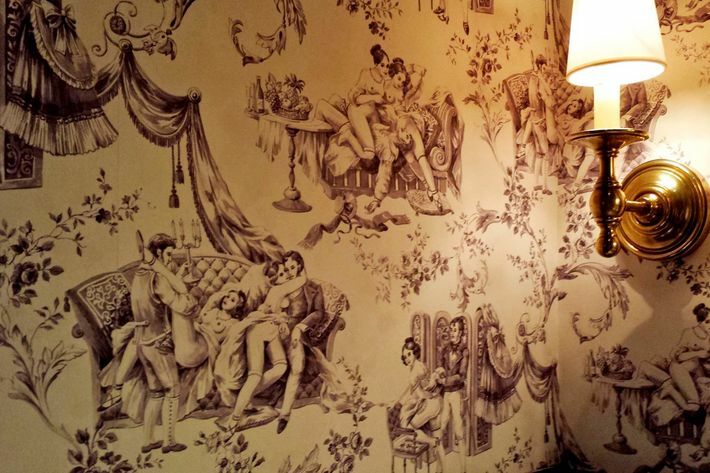 But a recent Battery visitor broke the rules and snapped these (NSFW) photos of the wallpaper inside one of the club’s restrooms. The Birches have said they aim to make the Battery a place “where inspiration is embraced, diverse communities come together and egos are checked at the door.” Looking at nineteenth-century orgies while you pee is a nice perk, too.